An Alaska tour that captures the best of Alaska without the long distance travel each day. 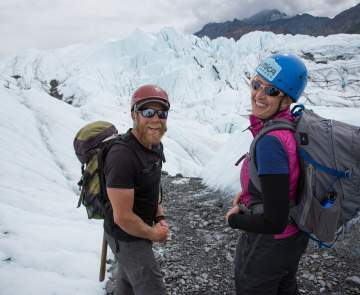 Make the most of your vacation and make the Mat-Su Valley your Base Camp for Adventure. Take a helicopter sightseeing trip to remote Knik Glacier. Not accessible to large group tours, your scenic journey will be up close to a calving glacier face. Eat lunch on the moraine of the glacier. Visit the Iditarod Headquarters in Wasilla and learn about the internationally famous 1,000-mile race to Nome. Overnight in Wasilla. Spend a day enjoying the history and beauty of Hatcher Pass. Start by taking a guided tour of Independence Mine Historical State Park and learn about the gold rush in the early 1900s. 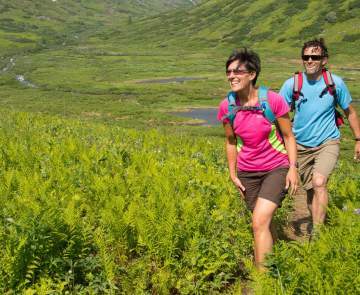 Then take a hike on one of Alaska&apos;s most popular trails in the high alpine tundra. Return to Palmer and visit the gardens at the Palmer Visitor Center and discover the agricultural roots of the Mat-Su Valley by visiting the Colony House Museum. Overnight in Palmer. Head up the Glenn Highway, a National Scenic Byway, to Mile 100 and explore the magnificent Matanuska Glacier, the largest road-accessible glacier in Alaska. Walk and take pictures of the ancient ice or take a guided tour by professionals who will outfit you and teach you about the ice formations. In the afternoon ride the whitewater rapids of the Matanuska River for an exhilarating adventure. Return to Palmer and overnight. Drive north to the quaint town of Talkeetna known as the base camp for Denali adventures. You will hear many different languages in the cafés on Main Street during the climbing season of May - July when more than 1,000 climbers attempt the summit of North America&apos;s tallest peak. You can take a scenic flightseeing trip around the summit of Denali. Even land on a glacier at base camp and experience the climbers&apos; returns from their 3-week journey. Visit the Walter Harper Denali Ranger Station in Talkeetna and learn more. After a gourmet lunch at one of Talkeetna&apos;s cafés, take a scenic jet boat ride up the Susitna River and watch for wildlife and photograph Denali from a new perspective. Overnight in Talkeetna. Spend a day on the world-class salmon rivers that surround Talkeetna. Hire a local guide for a ½ day or full-day of memorable fishing. They will even clean and fillet your salmon and send it to your home so you can share the memories with your family and friends at your own salmon bake. Overnight in Talkeetna.